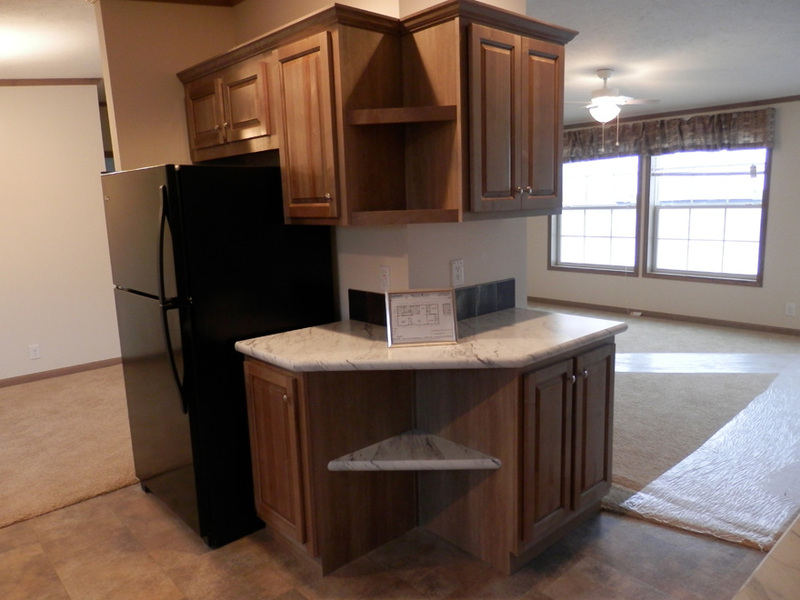 The South Bend model has 3 Beds and 2 Baths. 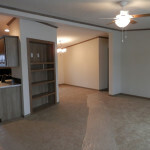 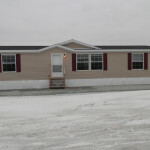 This 1493 square foot Double Wide home is available for delivery in Indiana, Illinois, Michigan, Ohio, Kentucky, Minnesota, Iowa, Missouri, Wisconsin. 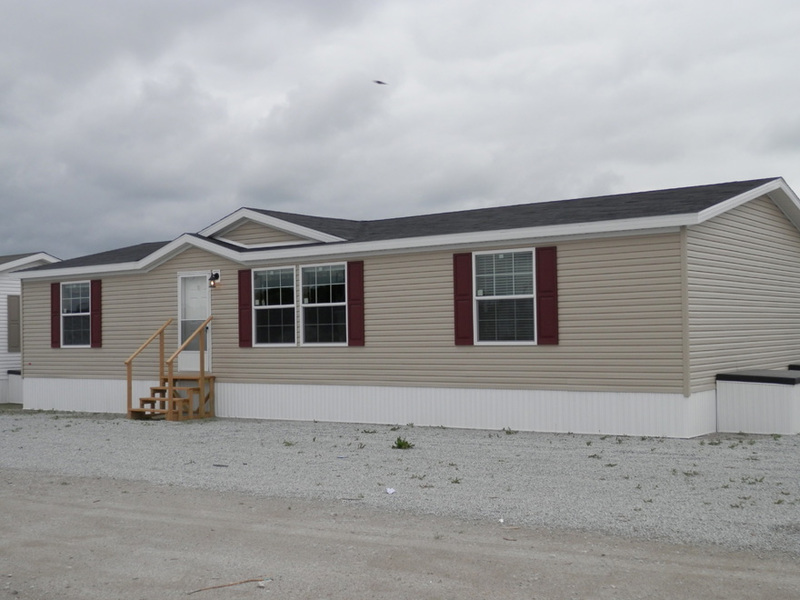 Whether you are a family of moderate size, or simply a couple requiring extra elbow room, the well-liked South Bend model easily satisfies the demand for storage and space. 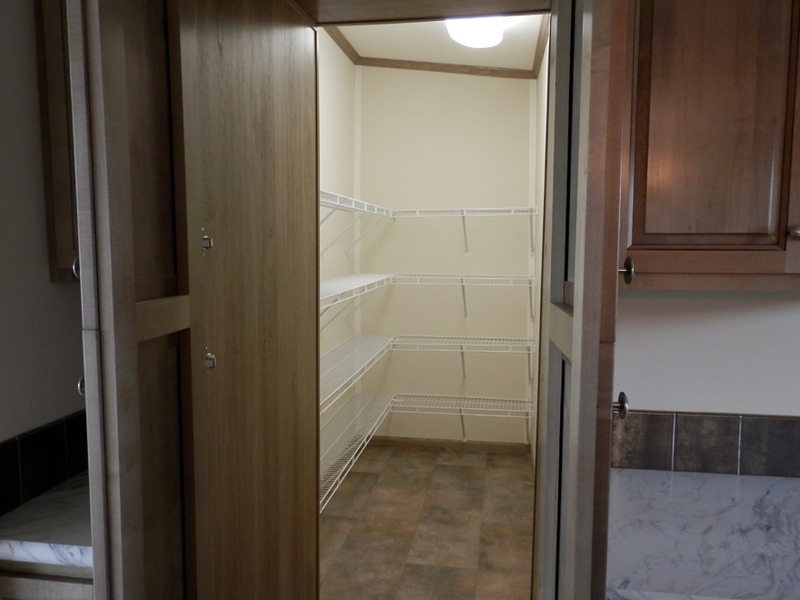 At right around 1,500 square feet, this is one of the most affordable 56’ long doublewides we offer. 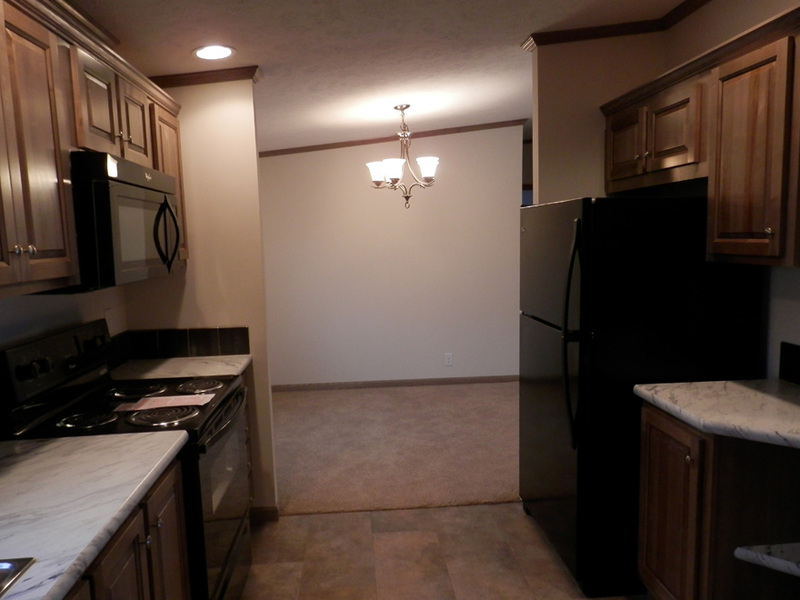 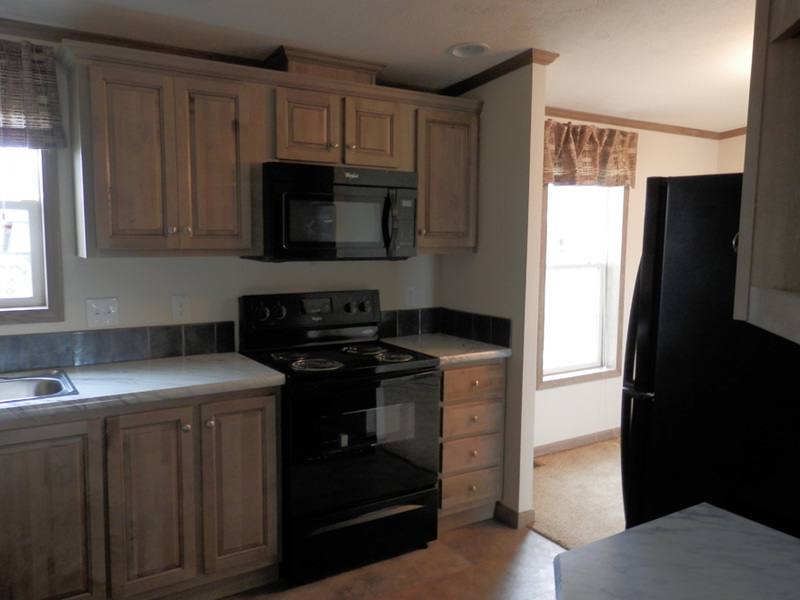 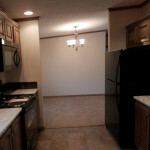 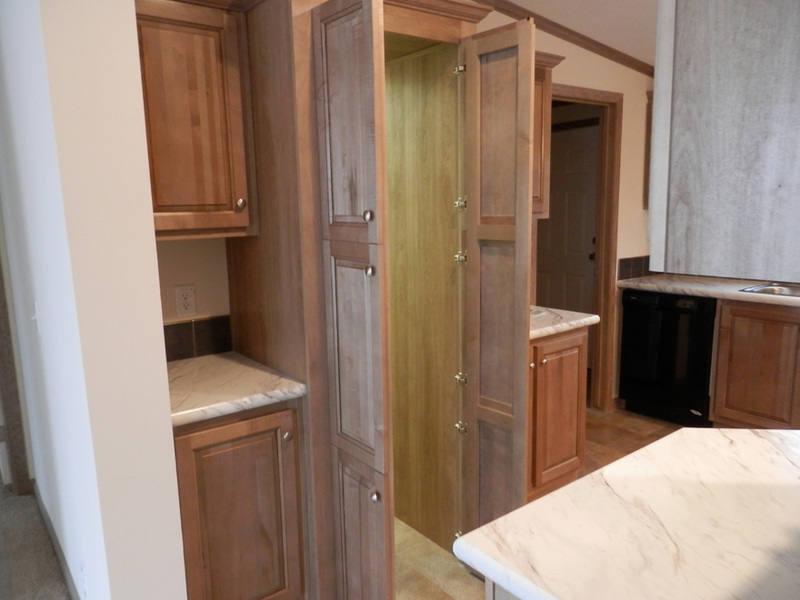 The hefty sized walk-in kitchen pantry is a shining star of this manufactured home. 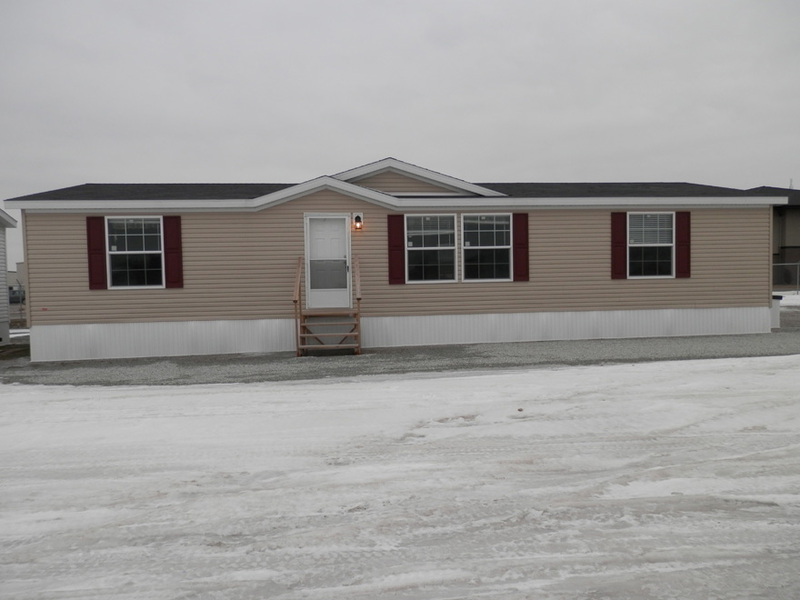 Double porch dormer, posts, steps, porch and railings done on site by others. 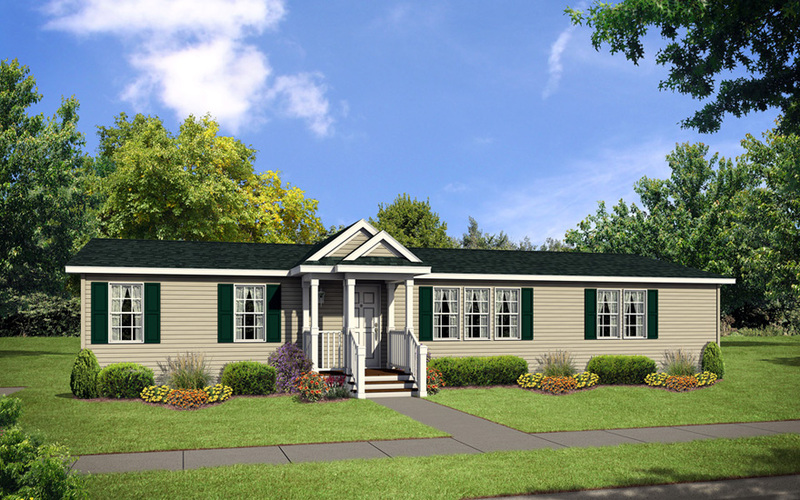 Shown with 3 extra windows, olive siding, green shutters, black shingles, white trim and white exterior coach light. 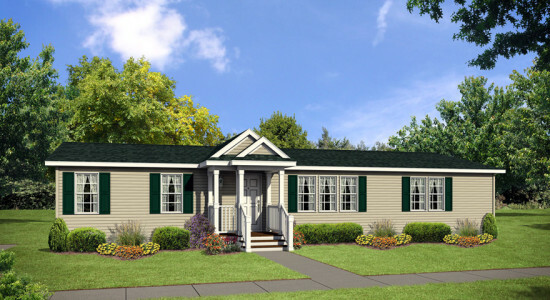 Shown with a 16′ Eyebrow dormer, clay siding, burgundy shutters and black shingles. 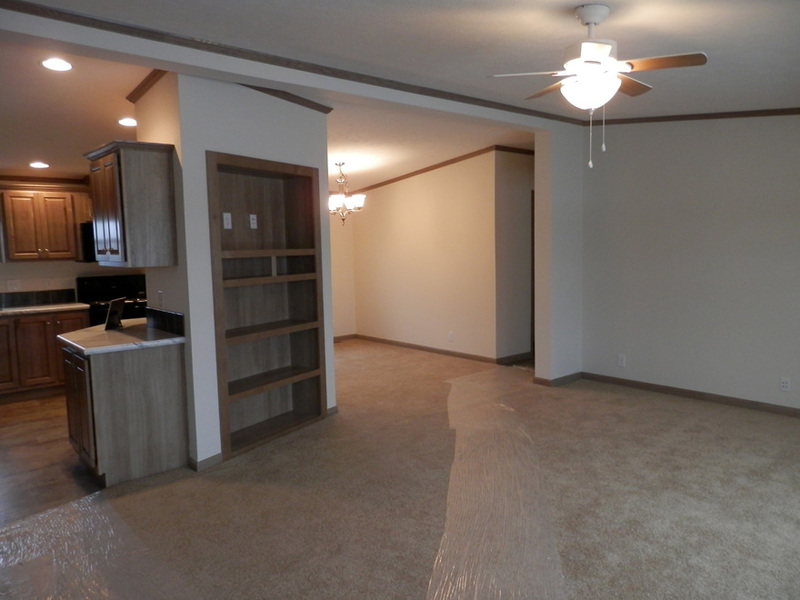 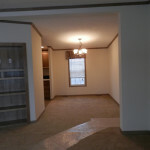 Living room with ceiling fan and Brownwood carpet. 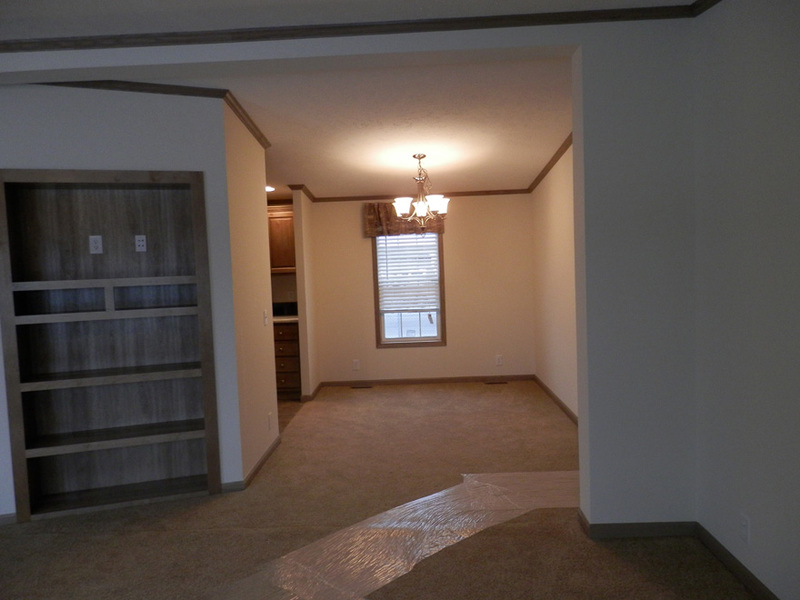 Dinign room with 5 arm chandelier. 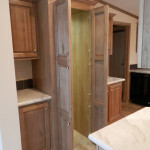 Hardwood Urban Putty cabinets leading to hidden pantry. 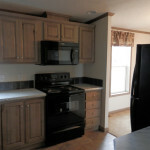 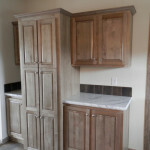 Shown with optional Urban Putty hardwood cabinets, Calcutta Marble counter tops and finished drywall. 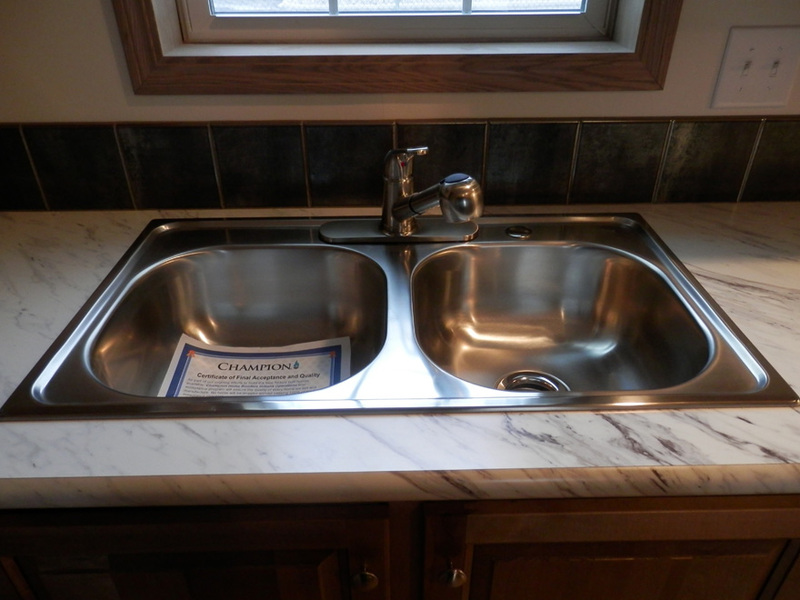 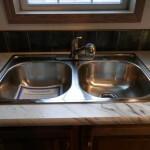 Stainless Steel kitchen sink with single lever faucet and sprayer. 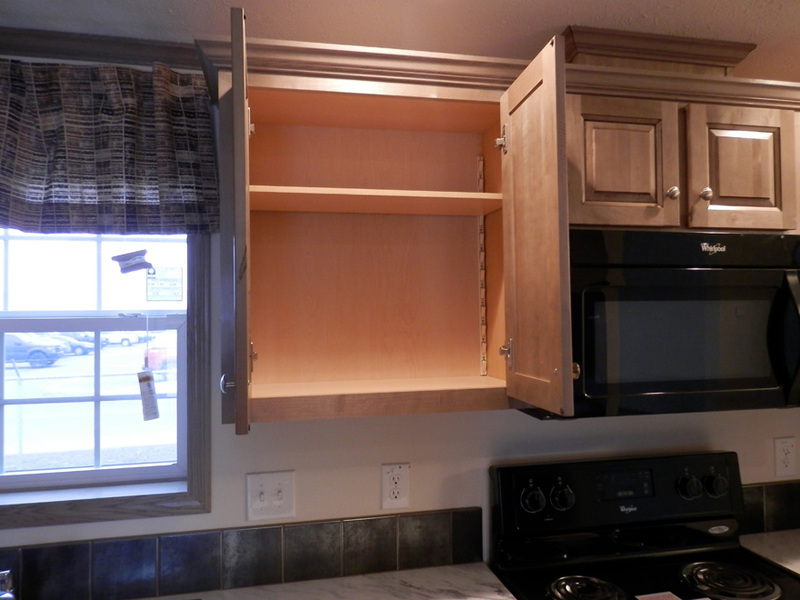 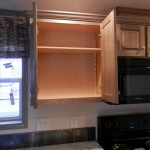 Lined overhead kitchen cabinets with adjustable shelves. 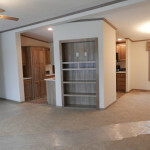 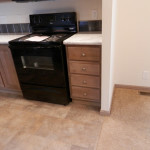 Shown with Multi-Fired Bisque linolium flooring. 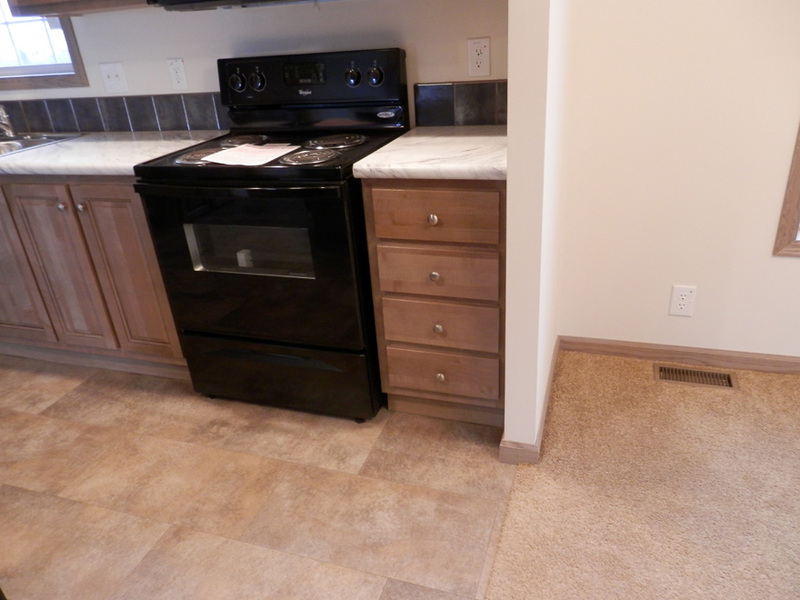 Shown with appliance package, 21 cubic foot refrigerater, microwave over the range, elecgtric stove, can lights and Hardwood Urban Putty cabinets. 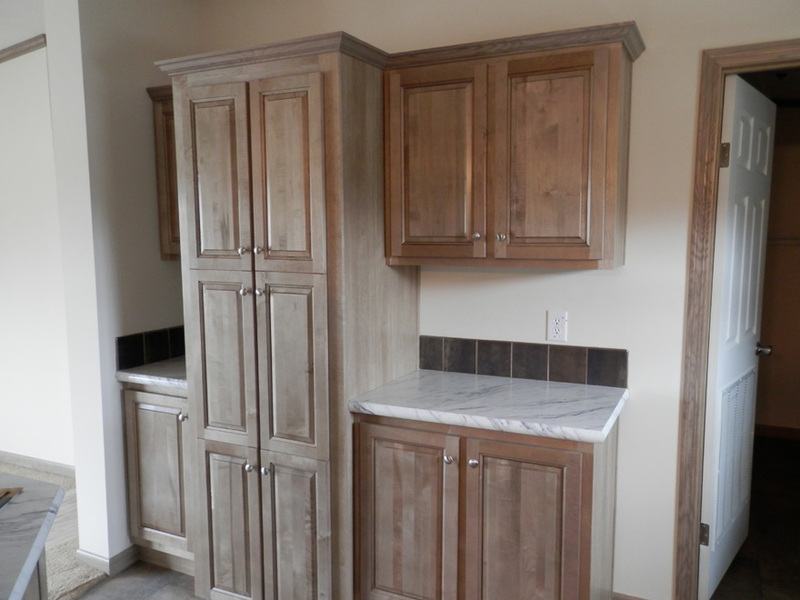 Kitchen with Urban Putty Hardwoon Cabinets, electric stove, microwave over stove, Calcutta Marble counter tops, Graphite ceramic backsplach, hardwood trim package and finished drywall. 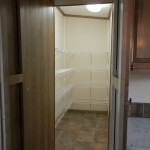 Large, walk in kitchen pantry. 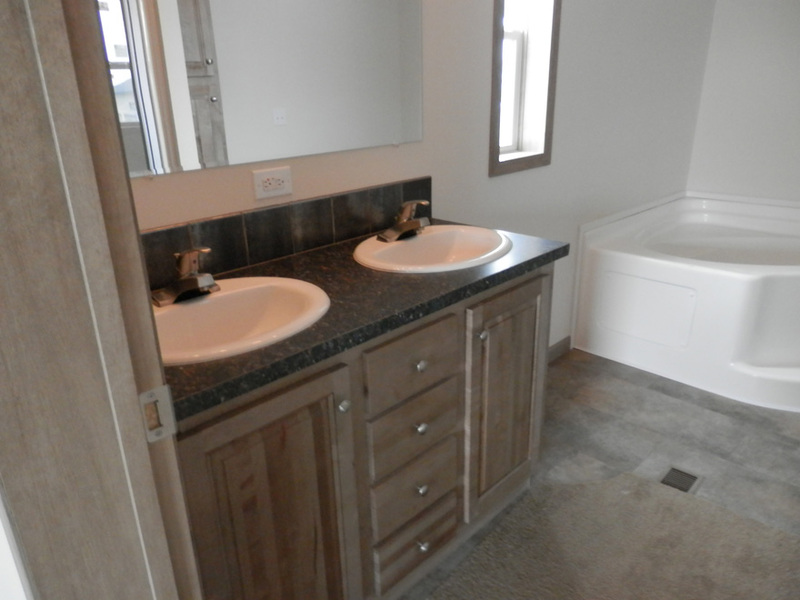 Optional master bath with dual lavs and corner garden tub. 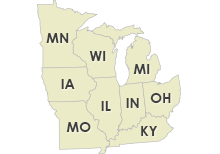 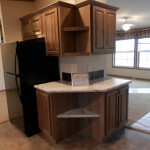 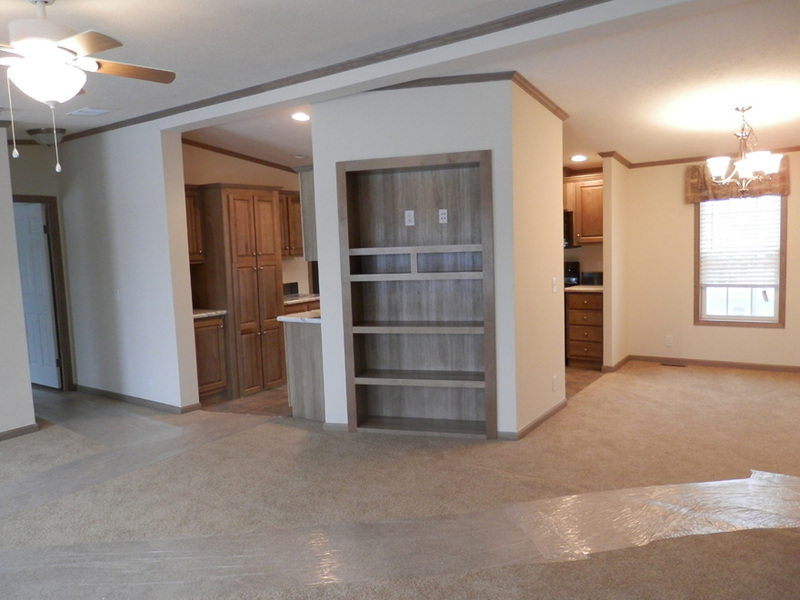 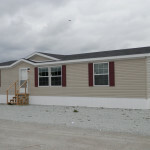 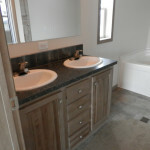 Ask your housing consultant about the other great features that come standard on the South Bend manufactured home.